October 8, 2006 around 5a or earlier, I got up to make another bathroom run. On the way I felt a very small, wet gush. What the..? I threw on the lights and "Andrei! I think my water just broke!" Now fully awake, excited and a little confused, we debated on whether it was my bag of waters trickling down my leg or something else (moms, ladies, most of you know what I'm referring to here). In the end we decided that it was a false alarm as I was not sure that I had lost my mucus plug and had no bloody show later, plus I was still 3 weeks from my due date. We had heard stories about couples so excited to have their baby that they misinterpreted the signs, got themselves worked up, and called the doctor/midwife way too early. We didn't want to provide another silly story for them to tell. We tried to go back to sleep, but strong waves of adrenaline rushed over me and I had light, regular contractions for an hour. That was a long hour. Eventually everything died down and I slept another hour or two. It was a Sunday, also our wedding anniversary, so after stocking up on feminine products (to contain a drastic increase in secretions) we headed to church. I was pretty sure I'd have the baby in the next 24-36 hours. At 1:30p I felt another little "pop" and subsequent trickling, and this time I was more confident (but still not totally sure) that my water had broken. I think around 2p contractions started coming every 7 minutes, so I called Angela, my sister-in-law/doula, to discuss it. 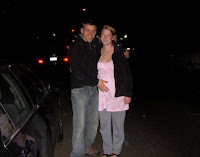 From her I was searching for confirmation of my suspicions and "permission" to call my midwife Tracy. When I did call her, I remember talking a little louder and faster than usual and being slightly out of breath from excitement. Both ladies told me to drink, eat and take it easy. They agreed I could go for a walk. Beaming and looking forward to each contraction, we went for a long walk during which Andrei faithfully timed the contractions. I was a little disappointed that they were so light and that the longer we walked, the less frequent they became. Not true labor, I decided. Shoot. By the time we arrived back at the house, they had all but disappeared. Tracy called around 6:30p to check in. When I told her that they had stopped, it didn't seem to faze her and she again told me to drink, eat and try to relax, even sleep if I could. She said she'd keep checking in and that she expected me to give birth by the next morning. I was encouraged. If I remember correctly I spent the next couple of hours dinking around and preparing a bag to take to the birth center with fresh clothes, food, icons to focus on during labor, a compilation cd I made for laboring, and other little things I thought I might want. After dinner we decided to watch a movie to get my mind off things and to begin winding down so I could get a little sleep. We didn't have many choices, but Pride and Prejudice (the new one) seemed like a good, low-key choice. So I took a seat on my trusty exercise ball, had some tea and began watching with Andrei at my side--such a trooper. My contractions were still far apart, but I was generally uncomfortable and the movie became so dang annoying: I couldn't hear the dialogue for one thing, and the music was shrill, and I just was not into it AT ALL. At that point I'm sure that any movie would've been hard to watch. Around 9p Angela called and suggested that I take a bath and then go to bed. She said to call her once the contractions came every 4-5 minutes. I finally did lay down, and very soon after that the contractions became regular and their strength slowly increased. I stayed in bed on my left side and breathed through them, closing my eyes and trying to fully relax between them. After an hour or so of pretty light contractions, I asked him to provide counter-pressure on my lower back as they got harder--and so began his marathon. It really seemed to help, mostly as a distraction...similar to how I push on bug bites with my finger nail so that the pain overpowers the itching, helping me not to scratch at them. Early labor is a sweet memory for me. It was the beginning of the end of being just the two of us, and I felt such a strong bond with Andrei as we started on this new path together. When I look back and see how dependent I was on him throughout the labor process, I realize that I was clinging to him not just for support through the pain but for assurance that we are in it together physically, mentally, spiritually. By 12:20a the contractions were coming every 3-4 minutes and lasting about 90 seconds. It was getting "pretty serious" (I'm hearing Kip's voice as I type that). Still, I hesitated to call Angela because I didn't know if we really needed her to come. I didn't know what kind of support I'd need and I didn't want to make a big deal out the whole thing :) I hated to think that I'd pull her out of bed after her particularly long week without adequate reason. Obviously I had no idea what to expect. Andrei finally decided to just call since she did say to let her know when we got to this point. So he called and voiced our hesitation, and she said that she'd come and if we didn't need her she'd just lay on the couch. (Angela, you're so sweet.) Soon she arrived and Andrei sighed with relief. Turns out he was getting a bit nervous and was glad to have a someone else around to ensure that we're all ok. By 1:45a the contractions had been 3 minutes apart and lasting 90 secs for an hour, so we paged Tracy and made plans to meet her at the birth center in 20 minutes. It was a cold night (was it snowing?) Anyway, I had a little pink nightie on and I almost walked out as is until Angela suggested I put on some pants. Before getting in the car, I had to walk out a contraction. 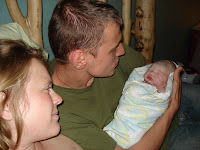 This is when I realized the beauty of home births. No car rides while in labor. Definitely a plus. When we arrived I practically ran up the stairs to the center, trying to beat the next contraction. I barely made it. This is when the fun began. Tracy checked my progress and I was 5 cm dilated, 100% effaced and baby was at zero station or "engaged". Pretty good, I thought. Andrei and I labor-danced for a while. I was really hanging on him, letting him hold a lot of my weight as I rocked my hips back and forth. Tracy can vouch for his hard work because at one point she relieved him for a bathroom break. Standing felt good, but I wanted to sit in between contractions to rest and getting up and down was too distracting/painful. So I tried the rocking chair for a while. That wasn't so great. The birth tub was getting warmer by then, so I stripped and got in on my hands and knees. (Now, I wondered how I'd feel about being naked during labor/birth, but at this point I couldn't have cared less about modesty. This was the last I'd have clothes on until Taia was born and I had taken a bath.) I was in the tub for a couple hours: on hands and knees, leaning over the side, sitting with my legs floating out in front of me. To help with the pain Andrei was still providing hard counter-pressure and helping me take slow, deep breaths, either moaning and/or pursing my lips on expiration. I had great support as the labor increased in intensity. Andrei was my rock, and I wanted him next to me every moment. And I was very grateful for Angela. She was a quiet presence and knew just what to whisper in my ear exactly when I needed it. Tracy kept assuring us that all was going well, and she gently and firmly guided me through the process. Everyone was great. There are a few particular things that stick out in my mind from this time. -My legs were shaking uncontrollably (which is normal) and it was really bothering me because it made it hard to relax. -I withdrew into myself and grew a bit melancholy. I didn't put on my cd nor set out my icons and candles. Nothing I brought got used. -The thought did cross my mind that there was pain medicine for this sort of thing; but I immediately decided that even if I could have it right now, I didn't want it. -At one point I was having so much trouble with the pain and even more so with emotional/mental endurance, I started praying in Russian: Lord have mercy, Lord have mercy, Lord have mercy...I couldn't think of any other way that I could get through it. -I couldn't imagine doing this for a second child. At 5:10a I had progressed a measly 2 cm for a total of 7. I couldn't believe it. Everyone was telling me that this is good and that I'm coming along. I wanted to believe them. Soon after, I got out of the tub and lay in bed for a while. According to Angela's notes the contractions were "very painful" at 5:40a and I felt like I couldn't do it at 6:00a. An hour later I was 9cm dilated. I'm getting a little tense just remembering it--so much anticipation and frustration. I remember having my face buried in pillows for a while and when my head finally emerged, it was light outside. I was so disappointed that the night was over and I still hadn't had the baby. I started feeling "pushy" by 7:45a. I was totally dilated, except for a pesky lip. I got up to labor dance and sit on the ball. Around 8:30a Tracy got me on the bed again to check me, and as I lay down I had indescribable pain. Something about the movement or position...Anyway, it died down once I got settled, but then there was no way I was going to get off that bed. Finally I started pushing at 9am in a semi-sidelying position. By this time I began to think that Taisia was never going to be born. Even so, I decided to still give it my best shot. I pushed with all my might. I was instructed to push like I was having the biggest bowel movement of my life and to not be afraid of the burning when she crowned. But it was totally natural to push "there", and honestly I wasn't afraid of any burning--I was more afraid she wouldn't come out if I didn't push harder. So I pushed and pushed. My cheering section told me that they saw her head coming. I was frustrated every time I had to take a break from pushing because she'd slide back up slightly. I wished I could just keep pushing constantly. Later my voice was hoarse from all the vocal pushing :) At 9:40a Andrei (with Tracy's help) caught her sweet little body as she slid out, and he put her on my tummy. Whew. I wasn't surprised to see her, wasn't crying with joy, nothing like that. For a moment, it just was a fact that it was over and here she is, praise God. Taisia was a healthy little newborn: crying, moving, pink, and 6 lbs 4 oz. She was warm on my belly and she smelled amazing. The longer I held her, the more I grew attached to her. Our little Krasavitsa (Beauty). The last thing to do before I could relax in bed with my family was to deliver the placenta. I pushed and Tracy provided mild traction to help it out. The next thing I knew, Tracy was holding the other end of the cord, placenta still inside me. Andrei and I simultaneously thought OH NO and expected that we'd have to go to the hospital (I should've known better, but, hey, I just had a baby). Very calmly she simply clamped the cord so Taisia wouldn't lose any blood through it, I stood up, and she told me to push just like I had been pushing Taisia. So I pushed hard, and the placenta came flying out. Luckily it landed in the bowl they'd placed on the ground to catch it, but Tracy exclaimed "my shoes!" and half the floor (I'm exaggerating) was sprayed with the splash of blood. Turns out I had a velementous placenta; basically the cord was weakly attached to the placenta and so it tore away at the slightest tug. The other thing to note is that I didn't have any tears, unless you count a few "skid marks". Excellent! Finally I crawled back into bed to rest with our baby on my chest, husband at my side, sister and mom smiling on. Now I could admire my baby. Her frowning lips were bright red, her body covered in sweet-smelling vernix, and her brow was furrowed just like her papa's can get. She was a beautiful newborn. She didn't have any "unique" features that distracted the eye--everything was proportional and cute. Definitely the cutest newborn I've ever seen :) After all that work, she was exhausted and was determined to sleep. She was not interested in nursing nor in getting measured and checked by our wonderful nurse, Aubre. I was content to have her just rest in my arms. The next couple of months were magical, and I quickly forgot about the pain of labor and decided that my labor was relatively easy compared to how it could have been. AND UPON THOSE IN THE TOMB BESTOWING LIFE! И СУЩИМ ВО ГРОБЕХ ЖИВОТ ДАРОВАХ! "Today there is hung upon the Tree, He that suspended the earth upon the waters. A crown of thorns is placed upon Him Who is the King of the Angels. With false purple is He wrapped about, He that wrappeth the Heavens with clouds. Buffetings did He receive, Who freed Adam in the Jordan. With nails was He affixed, He that is the Bridegroom of the Church. With a lance was He pierced, He that is the Son of the Virgin. We venerate Thy Passion, O Christ. Show also unto us Thy glorious Resurrection." The services of Great Friday are dedicated to the commemoration of the sufferings on the Cross of the Saviour, His death and burial. At Matins, which is served on the evening of Great Thursday (as all services of this week are held the night before the actual day), the Reading of the Twelve Gospels takes place in the middle of the church. These readings are selections from the four Gospels which proclaim the Passion of the Saviour, beginning with His final conversation with the disciples at the Mystical Supper, and ending with His burial in the garden by Joseph of Arimathea and the setting of the military watch over His Tomb. During the readings, the faithful stand with lit candles, which are symbols both of the glory and magnificence which the Lord did not lose during the period of His suffering, and of the ardent love we should have for our Saviour. On Great Friday the Royal Hours are served, but Liturgy is never served, since on this day the Lord offered Himself as a sacrifice. Vespers is served at the ninth hour of the day (3 P.M.), which is the hour of the death of Jesus Christ on the Cross. In this service His removal from the Cross and His burial are commemorated. With the chanting of the troparion, "The Noble Joseph, having taken Thy most pure body down from the Tree," the clergy take up the Burial Shroud (an icon) of Christ lying in the tomb (called "Plaschanitsa" in Russian, "epitaphion" in Greek), from the Holy Table as it were, from Golgotha, and carry it from the Altar, into the center of the church, preceded by candles and incense. It is placed on a specially prepared stand that resembles a tomb, and the priests and all those present prostrate themselves before it and kiss the wounds of the Lord depicted upon it, the pierced side and the imprint of the nails in the hands and feet. The Burial Shroud is left in the church for three days, from Friday afternoon through Saturday and until the first moments of Sunday, in commemoration of the three day entombment of Christ. In the movie "Ostrov", the monk Fr Anatoly sings the following song from the bottom of his heart and with gusto. It is short, catchy and rhymes (in Russian). Andrei and I started singing it and it has become THE tune which calms Taisia, particularly when life is being unkind to her in the carseat. It is often in my head which is particularly fitting this Lenten season. Direct me, God, on my way. and so is my flesh. Помоги мне, Боже, на моем пути.